Some people may find a piece of twisted and worn driftwood on the beach and think that it has reached the end of a long and compelling voyage. James Doran-Webb, however, believes it is far from the end of its journey. 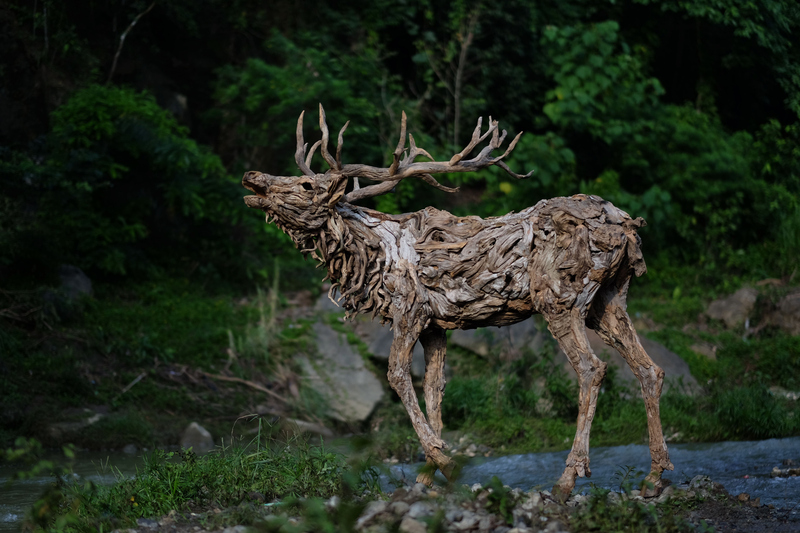 The sculptor and photographer has spent years collecting and transforming found driftwood of all shapes and sizes into life-like sculptures in motion. First beginning his craft of constructing animal forms out of papier-mâché, he soon shifted to creating beautiful representations of both mythical and real creatures out of found materials. Doran-Webb has used the Philippines as his site for finding driftwood and will enlist the help of the locals in the search. He reimburses the community with cash and through his project 80,000 Trees: for every kilo of driftwood he purchases from locals he plants one seedling in the hills of North and South Cebu. Doran-Webb is no stranger to sculpting from wood, as he enjoyed crafting his first figurines as a child. The projects he produces today are nothing short of extraordinary. Using woods of all different species lends to the complexity of the naturally twisting designs. So many of his pieces represent a snapshot in the lives of his creatures: fighting bulls, leaping horses, and crouching dragons all seem to be real creatures magically transformed into winding threads of wood. His pieces will be on display at an exhibition at The Contemporary Fine Art Gallery Eton in December, 2015. First beginning his craft of constructing animal forms out of papier-mâché, he soon shifted to creating beautiful representations of both mythical and real creatures out of found materials. Doran-Webb has used the Philippines as his site for finding driftwood and will enlist the help of the locals in the search. He reimburses the community with cash and through his project 80,000 Trees: for every kilo of driftwood he purchases from locals he plants one seedling in the hills of North and South Cebu. Doran-Webb is no stranger to sculpting from wood, as he enjoyed crafting his first figurines as a child. The projects he produces today are nothing short of extraordinary. Using woods of all different species lends to the complexity of the naturally twisting designs. So many of his pieces represent a snapshot in the lives of his creatures: fighting bulls, leaping horses, and crouching dragons all seem to be real creatures magically transformed into winding threads of wood. His pieces will be on display at an exhibition at The Contemporary Fine Art Gallery Eton in December, 2015.